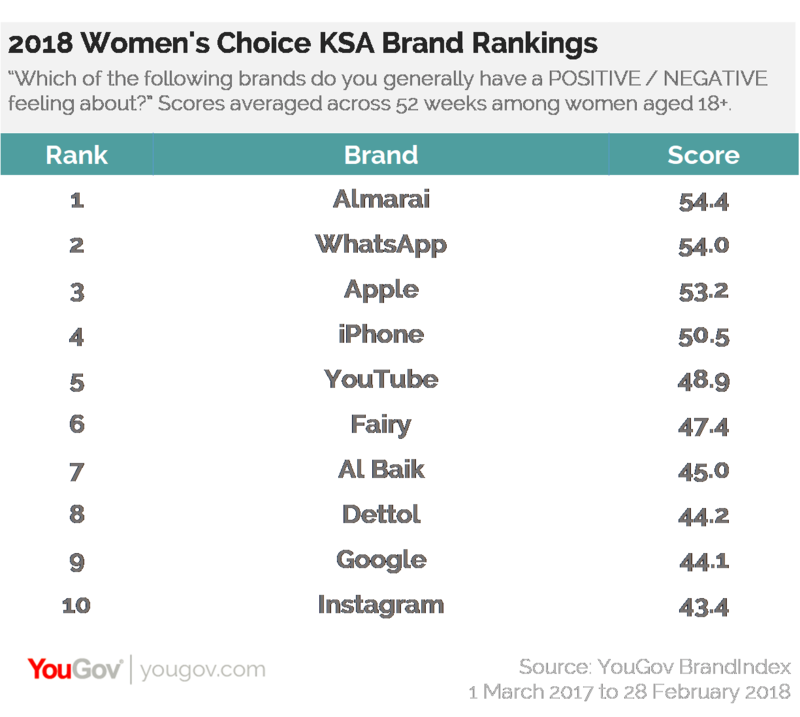 on March 23, 2018, 1:24 p.m.
Emirates and Almarai are the most Impressive brands among women in the UAE and Saudi Arabia according to the 2018 Women’s Choice Brand Rankings released today by YouGov. The rankings were compiled using the Impression score from YouGov’s daily brand tracker, BrandIndex, by asking respondents, “Which of the following brands do you generally have a POSITIVE / NEGATIVE feeling about?” Over the past 12 months, BrandIndex data shows the Dubai-based flag carrier airline and the Middle East’s largest dairy company have received the highest positive Impression scores among women in their respective countries. Impression scores provide a fundamental view of how well or poorly a brand resonates with a given population. The last year has seen Emirates host a range of new initiatives, including giving centre stage to its female employees on International Women’s Day. The brand gave wings to two female pilots to fly the iconic Emirates Airbus A380 from Dubai to Vienna as part of multiple events to mark the occasion. 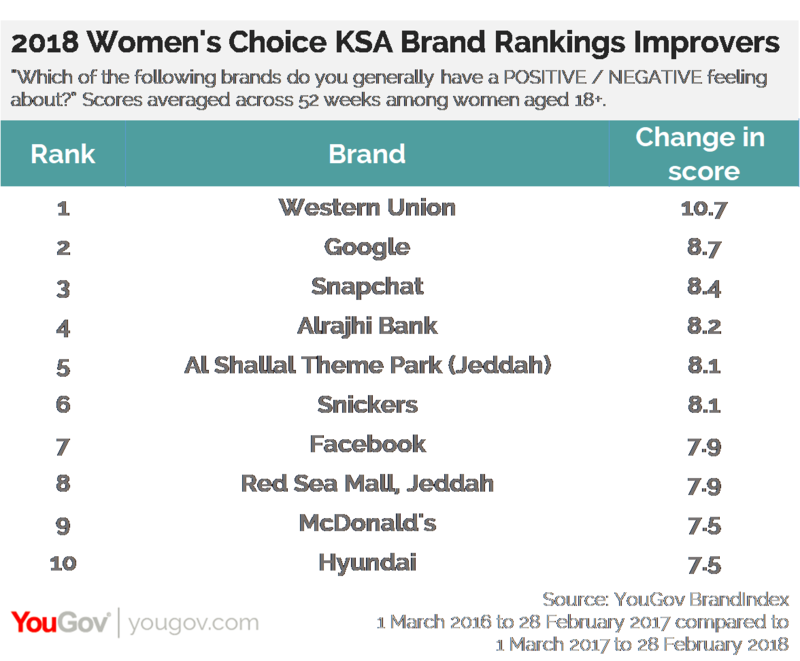 Emirates sits ahead of a range of world renowned digital brands in the minds of UAE women with WhatsApp leading the way maintaining second place since this time last year. iPhone makes a debut entry in sixth place, as does Almarai in tenth. Despite reports of diminished hype around the release of the iPhone 8 Plus in Dubai Mall last year, iPhone made an impact with the iPhone X and takes the top spot for Impression among women aged 18 to 24. The iconic smartphone brand also showed the second largest improvement for Impression among women over the past 12 months, gaining the most positive appeal among those aged 25-34. 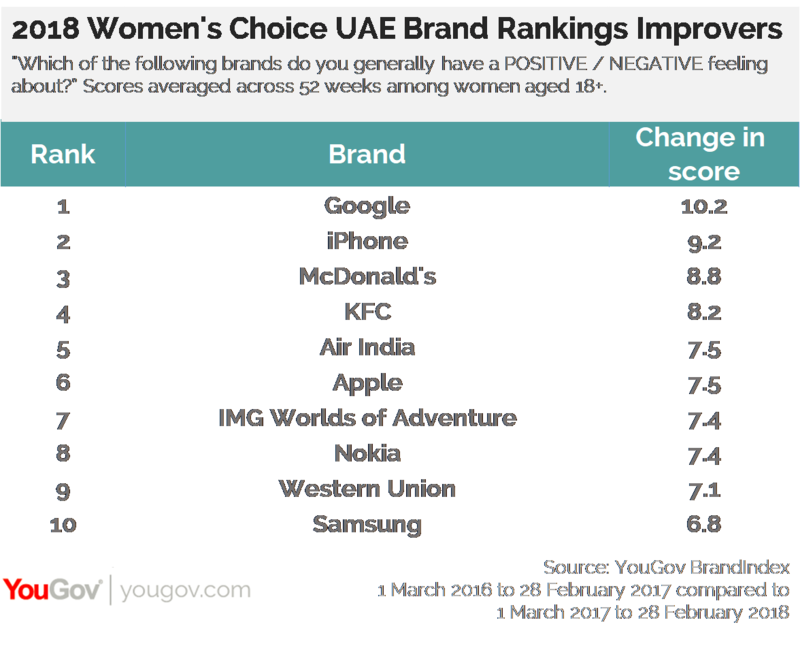 The UAE’s biggest brand improver overall when it comes to positive Impression among women is Google. The global search giant made the largest gain over the past 12 months, especially among women aged 35-44, rising five places from tenth to fifth. Google honoured women worldwide on International Women’s day 2017 with a Google Doodle slideshow to celebrate some of the female pioneers who paved the way to where we are today. In late 2016 Google also launched a YouTube hub called Batala, to promote female-led content. Almarai continued to resonate positively with consumers last year. The brand was one of the first to release their Ramadan campaign, a television commercial focusing on the emotion behind Ramadan, which received 1.5 million Facebook views within three hours. Though Almarai ranks the highest for Impression among women on the whole, there are noteworthy differences when it comes to the Impression of the top 10 brands among different age groups. Most notably, luxury electronics brand Apple, which sits in third place overall, actually takes the top spot for Impression among women aged 18-24. Meanwhile instant messaging giant WhatsApp, in second place in our top 10, proves most popular among women aged 25 - 34. As expected, Almarai leads positive Impression among those aged 35-44 and 45+ - its target audience among women. Western Union is the Kingdom’s highest improver where Saudi women are concerned with an uplift of 10.7 points for Impression. The global money transfer company launched a global empowerment campaign in 2017 to raise awareness and money for female education around the world for International Women’s Day. Naturally these improver scores differ between age groups. BrandIndex data shows Al Shallal Theme Park in Jeddah, the fifth most improved brand when it comes to Impression, has seen the biggest improvement among 18 - 24 year olds, while Facebook, in seventh, has risen most in popularity among women aged 25 - 34. BrandIndex Impression scores are calculated by subtracting the percentage of negative responses for the brand from the percentage of positive responses. Scores range from -100 to 100.